Model 1730 Intracellular Frame Assembly is designed primarily for intracellular recording and stimulation where high inertia, precision and clear access to the head during surgery are paramount. Cell penetration without surrounding damage demands the utmost in technique. 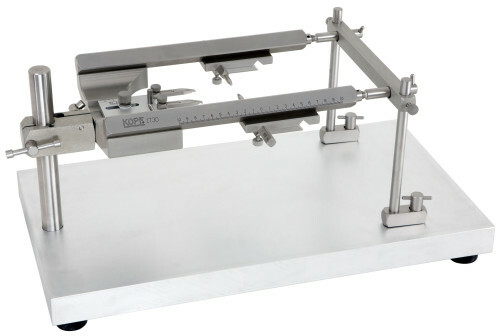 This instrument has the mass and rigidity necessary for use with ultra-fine micro manipulators or micropositioners. Designed specifically for use with the Kopf 1760 series Micro Manipulators. Manipulator product specifications and options are located here. Model 1735 Vertical Outboard Posts, which are secured at the ends with a tie bar to stop any vibration. Model 1745 Cat / Monkey Adaptor locates the animal firmly and accurately by means of tapered ear bars which fit into the external auditory meatus. Adjustable infra-orbital clamps and a vertically adjustable palate bar prevent rotation of the skull. (9.4 mm square with 50 mm calibration). This complete unit is mounted to Model 1711 aluminum base plate with four rubber feet to help dampen vibration. Delivers the ultimate in stereotaxic performance when there is no substitute for rigidity. While constructed for cats and monkeys, can accommodate other animals of this size or smaller by changing adaptors. Frame variations for special applications available upon request. The majority of Kopf animal adaptors can be used with this stereotaxic frame. The 1700 series ear bars are required.